This match was full on, unremitting confrontation from the very first whistle to last. In other words it was the very reason we love this sport. The weather made sure that the rugby played was far from Barbarian stuff but for pure drama this was difficult to beat. Scotland won the match and, much more importantly, they won back a a large measure of the self respect not to mention self belief that had gone AWOL this season. That RWC99 semi-final proved that sport cannot be measured in rational terms and this match only served to underline that fact. 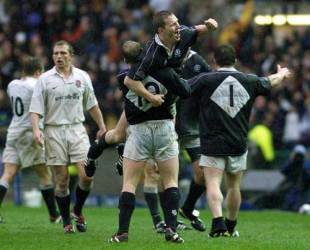 While flyhalf Duncan Hodge claimed all 19 of Scotland's points it required fifteen players to dredge the very last reserves of determination and effort to beat England for the first time in ten years. In the forwards Scott Murray and Martin Leslie put behind them their poor form and the latter in particular spent so much time in ememy territory that he probably works for MI5. They were ably assisted by that extra element that the miserable weather provided. The second half was played in a downpour which made any but the most basic of gameplan fraught with difficulty. It was a measure of how much was at stake that referee Clayton Thomas could wait just seven minutes before pulling the two captains aside to read the riot act after the second bout of handbags. Jonny Wilkinson and Duncan Hodge both fluffed early opportunities to go ahead in the opening quarter as both sides were over eager to compete for ball on the deck. The big hits were flying in, three times the touch judges intervened for foul play and there seemed little love lost between the two teams, several of whom are club colleagues. Andy Nicol opted for an attacking lineout with his second penalty but finally Hodge gave the home side a 3-0 lead on the twenty minute mark after Scott Murray had his legs taken out at at set piece play. The English reply was immediate. A deft kick by Mike Catt rebounded from the Scottish posts and earned England a short range scrum. The score was simple as Lawrence Dallaglio picked and went left without Andy Nicol laying a finger on him. There was a suggestion that Matt Dawson impeded his opposite number but the referee was happy, if not the Scottish supporters. Wilkinson kicked the conversion and then a 27 minute penalty after James McLaren attempted to claim the flyhalf's head for his mantlepiece, a sin the Scots' centre paid for with ten minutes on the side line. However England were unable to make good their one man advantage in the face of some gritty Scots play. Although the home side were now back to full strength they had to call on every ounce of determination after Chris Paterson's knock on had given the English another short range scrum. Time and again the English forwards threw themselves at the line but time and again they were repelled with some desperate defence. Two minutes and several penalties later it was England's turn to take to the rack. The Scots piled the bodies into the rucks and mauls, backs and forwards alike, but ended no more successful than England had been. At least something had finally roused Scotland prop Tom Smith from his seasonal slumbers and the sight of the England scrum engaging reverse gear on their own line did wonders for Scottish self-belief. The Scots had to settle for a final Hodge penalty deep in injury time to bring the scores to within one point (9-10) at half time. The second forty opened just as the heavens did likewise and the slippery conditions made handling a lottery throughout. The match restarted as the first half had finished with the Scots forwards driving into the heart of the England defence. Andy Nicol also tested Ben Cohen's ability to catch a greasy ball in blustery conditions and the Saints' winger was found seriously wanting. As they had done in the first half the Scots opted for an attacking lineout when Hodge should surely have been given a pot at goal. As they had done in the first half the Scots came away empty handed from the attack. In such a tight match the next score could prove decisive but neither side was confident enough to trust their hands in such dreadful conditions, Glen Metcalfe will confirm the ball was soap, and both sides were guilty of some aimless kicking. There was no second half scoring until the 60th minute when Richard Hill was found on the wrong side of a ruck dead in front of his own sticks. Hodge made no mistake and the Murrayfield crowd, criticised almost as much as their side, suddenly woke up to the fact that this match was up for grabs. Just as the fifteen on the pitch had become reanimated so too the sixty seven thousand strong crowd came to life. Every scrum awarded to the home side was greeted with a huge cheer. Scotland enjoyed all the pressure at this time and when Matt Perry was stragely hesitant under a Townsend high ball the home side threatened to cross the English line for the first time. The danger was eventually cleared after Hodge's optimistic drop goal went wide. With water lying in puddles on the pitch England simply didn't have the firm ground they needed to run the ball out of defence. Any ball they did win now had a blue shirt attached and Austin Healy was caught in possesion under his own posts just to prove the point. The Scots game plan, one pass and drive, was not pretty but it kept the pressure on the visitors. A series of drives into the heart of the English defence seemed destined for failure but Duncan Hodge scooped up the ball and dived full stretch over the line for the Scots' try. He converted his own try and the home side now enjoyed an astonishing 19-10 advantage with just five minutes of real time to play. Wilkinson pulled back three of those points with a 69th minute penalty but it simply was not to be England's day and the Scots held out for a famous win. England won the Championship Trophy but nobody at Murrayfield noticed. The Scots team came out for a lap of honour and they were mobbed by thousands of ecstatic supporters on the waterlogged pitch whom the marshalls wisely left to their own devices. Today was not a day to carp.